What better way to kick off the Christmas and seasonable festivities than by extolling the virtues of chocolate? Oh yes a little bit of the dark stuff will not only be nutritious but will also even help with the often accompanying stress of this time of year. But as they say, moderation is key. Enjoy! So let’s all jump up and down with glee and show our gratitude. I’m possibly the biggest fan in the entire world (although I know I have a lot of competition) and can honestly say that I’ve probably eaten chocolate nearly every day of my life. And as luck would have it, it turns out that eating it regularly is a good thing. Rather like taking a vitamin. However (and yes of course there’s going to be a caveat or two) the chocolate needs to be dark. In fact, the darker the better. There are two reasons for this. It also has less sugar. Now I know that some of you will be groaning and saying that milk chocolate is so much better but, like me, you can train yourself to like dark chocolate. And there’s a lot of choice these days with many wonderful varieties. I love the dark salted versions myself. So what are the miraculous benefits that chocolate contains? Well for a start it’s choc full (pun fully intended) of antioxidants that can have an amazing effect on your skin. One study reported in the European Journal of Nutrition found that consistently eating cocoa for 12 weeks reduced moisture loss in skin by 25 percent which is great news for people with a dry complexion. It can also protect your body against UV rays and boost blood circulation helping to better absorb oxygen and nutrients. On top of this it can reduce inflammation, stimulate the growth of beneficial bacteria in the gut and improve cognitive function. as the ‘love drug’ because it arouses similar feelings to being in love. Tryptophan is also found in chocolate which causes the release of serotonin – a great mood lifter. And of course it’s well known that endorphins are released into the brain when eating chocolate which decreases both pain and stress levels. As well as this, one of the fats in chocolate called anadamide (from the Sanskrit word for bliss) activates the receptor for dopamine production causing a feeling of intense wellbeing. It also has a positive impact on our cortisol levels which is one of the hormones released in response to stress. 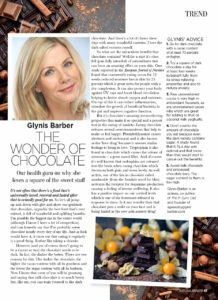 Is it any wonder then that chocolate puts a smile on your face and is being hailed as the new anti-anxiety drug? 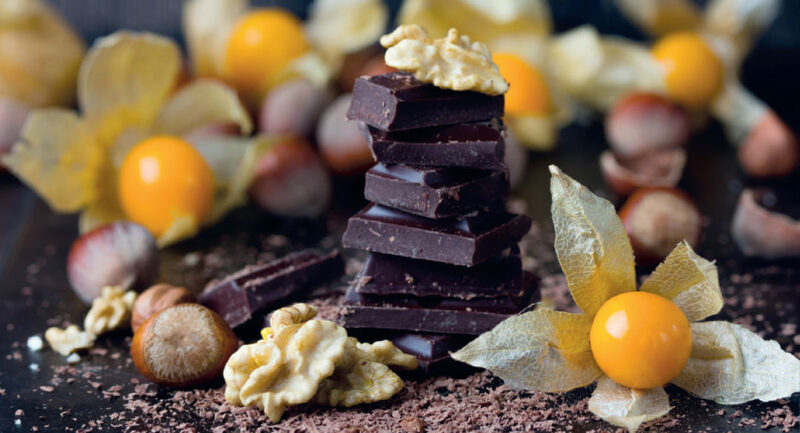 Go for dark chocolate with a cacao content of at least 70 percent or higher. Try a square of dark chocolate a day for at least two weeks to benefit fully from its stress-relieving properties and also to reduce anxiety. Raw unsweetened cocoa is very high in antioxidant flavanos are unsweetened cacao nibs which are great for adding to fruit or coconut milk yoghurts. Avoid milk chocolate and processed chocolate bars. The sugar content in them is too high.